In deepest darkest Canada, a woman named Helene (Patricia Owens) is found at the grisly murder scene of her scientist husband, Andre (Al Hedison), who she has seemingly crushed in a huge hydraulic press. She recounts the events that led up to Andre’s death to his brother, François (Vincent Price) and a police detective (Herbert Marshall). It all starts with the invention of miraculous teleportation booth. One disintegrated cat later, Andre thinks he has all the bugs worked out (sorry) and he tries it out on himself, unaware that he has companion in the booth with him, a simple house fly. Having seen the end of The Fly countless times on television (and that one episode of Happy Days), when I was younger, I really wasn’t expecting it to be the effective horror film that it is. The opening is a magnificent example of how to communicate horror though suggestion. The details of Andre’s demise are left to the viewer, with just a hint of Technicolor blood on screen to drive the point home. This sequence still works extremely well, and I can’t image how potent it would have been in 1958. With the fate of one of the characters known, the majority of the film is told via flashback as we get to watch the inevitable spiral of Andre and his family towards their awful destiny. It is sometime before Andre suffers his teleported accident, and the film's one big misstep, we never really get to see his initial reaction. The big reveal of his fly head and hand still looks great by today’s standards; the twitchy fly mouth really helps sell the effect. The fly with a man’s head at the conclusion is less successful, but the moment is so perverse and strange it’s relatively easy to overlook. The heart of The Fly is tragedy as much as it is horror. The viewer is forced to watch Helene and Andre’s son, Philippe (Charles Herbert) ineffectually try and help Andre. It’s always nice to Vincent Price cast against type and here he plays an entirely sympathetic character who only wants to set everything right, and in the end it’s up to him to protect Philippe from the horrible truth. The final moments are given over to a faux happy ending, but it’s such a fleeting moment it barely registers against what has come before it. The Fly has rightly earned its longevity; the production, the acting, and writing are all top notch. Its especially notable in an era where most horror was given over to atomic driven fears of giants and mutants. The villain here isn’t the bomb, it’s a man pushing his boundaries and suffering a terrible accident in the process. I think the 1958 original can stand toe to toe with the possibly even more well-known 1986 remake by David Cronenberg. 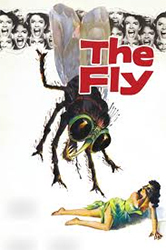 The Fly can still horrify viewers over fifty-five years later and I suspect it will be able to do so long after that.